The EWCL Snow Leopard team of class 5 worked with partners in Mongolia to develop a summer eco-camp in 2014 to raise awareness and an ecological understanding of snow leopards within one of the species’ range countries. Snow leopards (Panthera uncia) are a charismatic but poorly understood species of Asia’s high mountains, with some 6,000 individuals remaining in the wild. Their primary threats include poaching, retaliatory killings, and climate change. The eco-camp in Mongolia, which met in two one-week sessions, focused on educating, engaging, and raising awareness among middle and high school aged students on issues related to snow leopard ecology and conservation. 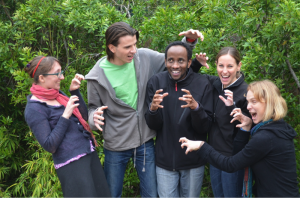 The Snow Leopard team created a 64-paged environmental education curriculum around which the camp was centered and reached a total of 40 students and four instructors during the summer of 2014. The team secured funding to provide camping supplies and program necessities for each of the students at both camp sessions. Also, through the help of in-kind donations, the team created promotional materials including logos, posters, and brochures for possible “Climbing for Snow Leopards” events that would involve partnering with climbing gyms to raise money and awareness about snow leopard conservation. These items are available to any group or individual interested in starting a snow leopard fundraising campaign. The EWCL Snow Leopard team secured funding through Disney Worldwide Conservation Fund and an online crowdsourcing campaign via GoFundMe.com. These funds directly supported two five-day camp sessions led by the Snow Leopard Conservation Fund in the Gurvantessoum district of Umnugovi Province in southern Mongolia with the aim of better integrating ecology lessons into the regular school curriculum. Twenty children and two teachers from the local schools attended each session, reaching a total of 40 students and four teachers in the summer of 2014. The Snow Leopard team developed a custom curriculum for this eco-camp, covering topics from Mongolian ecology to climate change to the issues facing snow leopards in their natural habitat. In addition to this classroom learning, students spent time in the field observing ibex and wild sheep habitat, both species that are important prey animals for snow leopards. Student attitudes toward snow leopards were assessed at the beginning and end of each camp session. Assessments from the first camp group indicate that all students had indirect contact with snow leopards, particularly through television and film, whereas only two students had had a direct interaction. Initially 27% of the students reported not liking or having negative attitudes towards snow leopards. The survey provided at the end of the camp session showed that all of the students reported a greater understanding and appreciation of the species. 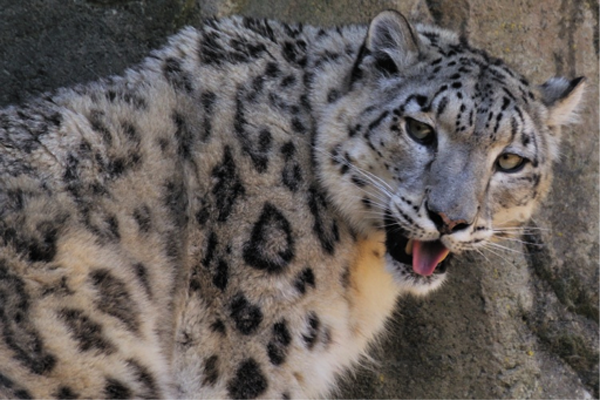 One student, who reported a negative interaction prior to attending the camp of watching a snow leopard feed on livestock, initially commented that he did not like snow leopards. At the end of the week long camp, this student indicated that his perspective on snow leopards was now positive, stating, “At the beginning I didn’t like, after [I] came here I got information about snow leopards. Many of the students still reported being afraid of snow leopards at the end of camp. However despite this personal feeling, they understood that the snow leopard is an important and necessary part of the ecosystem. In an unexpected outcome of the camp, the campers and their teachers decided to develop a school-based Eco-Club, called Snow Leopard Conservation. The team also worked with Iowa State University graphic design students to create promotional items for a possible snow leopard fundraising event called “Climbing for Snow Leopards”. The event idea is modeled off of the wildly successful “Bowling for Rhinos” campaign as well as Houston Zoo’s “Climbing for Clouded Leopards” event. Interested groups or individuals could partner with climbing gyms or climbing wall facilities to raise money and awareness about snow leopard conservation. The EWCL Snow Leopard team has created posters, logos, and informational brochures available for any group or individual interested in putting together such a fundraising event. The items have already been distributed to the conservation department at the Blank Park Zoo in Des Moines, Iowa for future conservation and education events. Support snow leopard conservation by donating to the Snow Leopard Trust, Snow Leopard Conservation Foundation, or World Wildlife Foundation. Educate yourself and others about the threats to snow leopards and other high elevation species. Do your part to combat climate change, which affects all species including ourselves, across the globe. Find out what your carbon footprint is at WWF Eco Guru, and learn how you can lessen your impact.